"Maintains a sharp point like that of a mechanical pencil. The break-resistant lead of these pencils is also super-bonded for maximum durability." "Includes three charcoal pencils of varying hardness, a 100% graphite pencil, three charcoal sticks, and three sketching sticks." "A textured grip at the bottom of each pencil creates an ergonomic design and prevents slipping while you use them." "Specifically made for artists and students. The pencils...are of the highest quality, made with graphite, clay, and lead that is always smooth." "This popular and high-quality pencil set allows you to get the depth of darkness and hue you need to properly shade any sketch or drawing." "This set has so many tools that it fits the needs of a new student or an amatuer artist...The nontoxic pencil set is also particularly great for kids." "LYRA’s drawing pencils come in a variety of hardnesses...these water-soluble pencils are simply high quality." From one of the top names in pencils, the Staedtler Mars Lumograph pencil set is a high quality option for anyone who draws in pencil for work or for fun. This 12-piece pencil set comes in a metal container to store your drawing implements and includes 6B, 5B, 4B, 3B, 2B, B, HB, F, H, 2H, 3H, and 4H pencils. The Mars Lumograph pencils are designed to wear evenly for optimal sketching and will avoid bending or breaking. With a sharp point, the break-resistant lead of these pencils is also super-bonded for maximum durability. The pencil itself is 12 millimeters in diameter has a smooth, comfortable grip. These pencils do not feature erasers, but do erase cleanly with a separate eraser. This 21-piece set delivers a variety of drawing pencils and supplies at a very low price. Perfect for kids, beginners, and most importantly, art students who are budget conscious, Royal & Langnickel’s set features eight high quality graphite pencil types: 4H, 2H, H, HB, B, 2B, 4B, and 6B. This affordable set also includes three charcoal pencils of varying hardness, a 100% graphite pencil, three charcoal sticks, and three sketching sticks. You can easily create a complex shaded drawing by mixing charcoal and graphite with pencils and sticks. The set also includes an eraser, a kneadable eraser, and a sharpener. Although this set does not include a carrying case or the variety of graphite pencils that some sets have, the price is a major factor in the product's popularity. If you’re looking for pencils you can use for writing as well as sketching, try this mechanical pencil set from MozArt. The set includes for different size pencils (0.3, 0.5, 0.7 and 0.9 millimeters), plus extra erasers and lead. The pencils are ready to use right when you receive them and all you need to do is click the button on the top of the pencil to dispense lead for your sketches, writing, or other needs. A textured grip at the bottom of each pencil creates an ergonomic design and prevents slipping while you use them. Reviewers say this set is well made and, despite being made from plastic, appear really expensive. If you love to sketch, it’s important to have the best pencils on hand for the best results. Try the Faber-Castell 9000 Graphite Sketch design set. This reliable and venerable set of pencils features 12 German-made graphite drawing pencils ranging in hardness from 8B to 2H. Faber-Castell explains that this set of pencils is specifically made for artists and students. The pencils themselves are of the highest quality, made with graphite, clay, and lead that is always smooth. The SV bonding in the Faber-Castell sketch pencils help prevent breaking for a more reliable drawing experience and a more durable pencil. Customers who reviewed the pencil set praise the overall quality of the product. Available in hard, medium, soft or full range varieties, the Derwent Graphic Drawing Pencils set will give you all of the pencil types you need for success. This popular and high-quality pencil set allows you to get the depth of darkness and hue you need to properly shade any sketch or drawing you may be making. This pencil set can also be purchased as a set of four, 12, or 24 pencils. The harder pencils features a 2.2mm core, while the softer black graphites have 3.5mm cores for larger lines — also good for shading. These versatile pencils are made with the durable construction of other drawing pencils, including strong cores. To get shading with the Derwent Graphite Drawing Pencils, simply pick the number and type of pencils you want. While any set of drawing pencils can be used by beginners, the best ones include all the tools you need to make a great pencil sketch. Magicfly offers a 41-piece set that has a little bit of everything, but at a good quality and reasonable price, to get any beginner ready to draw. The set includes 12 graphite pencils of varying hardness (8B,6B, 5B, 4B, 3B, 2B, B, HB, 2H, 3H, 4H, and 5H) as well as three charcoal pencils, three charcoal sticks, a soft woodless drawing pencil, multiple graphite drawing sticks, and four pastel graphite pencils. 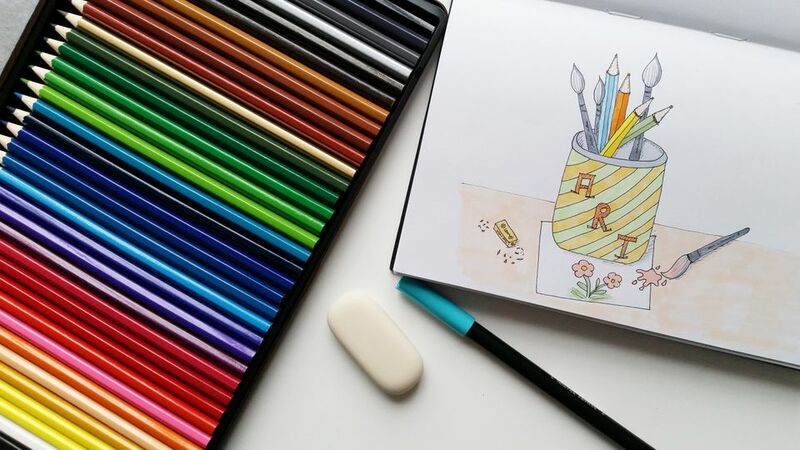 Magicfly’s drawing pencils also come with sharpeners, erasers, extenders, pencil knives and other accessories including a sketch pad. This set has so many tools that it fits the needs of a new student or an amatuer artist just as well. The nontoxic pencil set is also particularly great for kids. For a set that has everything you need to get started sketching and drawing, the Magicfly pencil set is a great option. When you’re sketching a realistic portrait of a client’s face or an experimental drawing of a loved one, you’ll want durable and pointed pencils. LYRA’s drawing pencils come in a variety of hardnesses (6B, 5B, 4B, 3B, 2B, B, HB, F, H, 2H, 3H, and 4H) and feature a high breaking strength. These water-soluble pencils are simply high quality. The company claims that they lead to “exact” results, which is crucial when you’re sketching a face.